With a degree from Chestnut Hill College in reach and a job in a research facility at the University of Pennsylvania, Kiara Wilson could not have a pictured herself living in a shelter nearly two years ago. “Shelter life is something a child should never experience,” she says. Her children are always her priority and despite their circumstances, she is working to build a better life for them. Much of Kiara’s talk about the shelter focuses on the impact the situation is having on her son and daughter. Just last month, a man was shot in the street outside the shelter and the shooter attempted to force his way inside. Scheduled meal times create an erratic schedule for her young children. The attitudes of other parents and children do not mesh well with the way she has raised her own. Kiara’s journey to success was offset by a combination of domestic abuse, a job layoff, and the attempted suicide of her children’s father. Now, she, her son, 5, and daughter, 4, are navigating the United States’ affordable housing system in order to get back on track. That system faces serious cuts under the Trump budget. The proposed $6 billion dollars in cuts to the department of Housing and Urban Development will intensify difficulties for those who already live in public housing, let alone someone like Kiara who is fighting to find a place of her own. The conditions of the North Philly shelter where she is staying are disheartening at best. Kiara speaks of the lack of empathy displayed by those working in the system and the general sense of desperation among the shelter’s inhabitants. Through conversations, phone calls, and skips through the chain of command, Kiara is inching closer and closer to her goal of permanent housing with her children. I met Kiara about eight months ago when she enrolled her children at Mercy Neighborhood Ministries of Philadelphia, Inc. Our curriculum gave her peace of mind about her children’s early education experience as her children are able to benefit from high quality Head Start and Pre-K Counts programming. The collaborative spirit of Mercy has assisted Kiara in preparing for her next steps in life. In Philadelphia today, 186,000 citizens, nearly 12% of the population, live in deep-poverty. Many of them are in situations like Kiara’s. Yet, these aren’t the stories you’ll hear from proponents of cutting public funding for “services” that should be considered human rights. Rather, you’ll hear about abuse of the system and a culture of dependence. 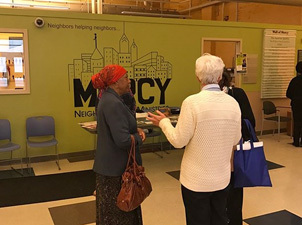 Our motto at Mercy is “Neighbor helping neighbor, transforming lives, one person at a time.” We cannot build a community by cutting off resources from its members. Over the next four years, it is my sincere hope that the voices in power can quiet themselves long enough to hear stories like Kiara’s and not simply view them as numbers on a spreadsheet. Steven Ziegler is the Director of Philanthropy for Mercy Neighborhood Ministries of Philadelphia, Inc. He is a Philadelphia native and has nearly a decade of experience as a nonprofit professional. This entry was posted in Front Page, Housing, Spirit Filled Network on June 15, 2017 by networklobby.